The Acura NSX pursues an altogether new and revolutionary idea for Acura supercar performance, melding timeless sports car values with next-generation technologies to create a New Sports eXperience. And much like Acura’s Precision Crafted Performance DNA guided the creation of the original NSX, every aspect of this new NSX is a next-generation expression of those same values. 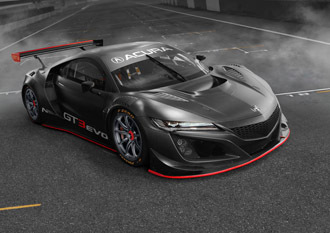 Based on the “man-machine synergy” approach that guides the development of all Acura vehicles, the company has created a driver-centered supercar, where every part of the vehicle is respectful of the smartest part of the car—the driver. Foremost among its many innovations is Sport Hybrid Super Handling All-Wheel Drive (Sport Hybrid SH-AWD), a first-of-its-kind technology in the supercar realm. Marrying this cutting-edge and electrified new expression of Acura Super Handling performance with new approaches to vehicle design—including advanced body construction, component packaging and aerodynamic optimization—results in a supercar that faithfully translates the acceleration, steering and braking inputs of the driver with incredible fidelity and instantaneous response, thus amplifying the capabilities of every driver, while greatly elevating the dynamic experience in every driving situation—qualities that define the New Sports eXperience. The revolutionary NSX Sport Hybrid SH-AWD power unit and its advanced dynamic capabilities are supported by new concepts in supercar design and body construction. The NSX multi-material space frame is a clean-sheet design, utilizing a multitude of advanced materials and joining technologies, each chosen for its capability to deliver ultimate global and local body rigidity in combination with low mass, outstanding visibility and world-class occupant crash performance. The space frame integrates several world-first technologies, including three-dimensionally bent and quenched (3DQ) ultra‑high-strength steel A-pillars and ablation cast aluminum frame nodes.